Alongside all-day family cooking and binge watching the Lord of the Rings trilogy, tis the season for our favorite holiday tradition, our Year in Review. Last year we added a new feature to the Best Of... series, a feature on a music genre that captivated us over the course of the last 12 months. 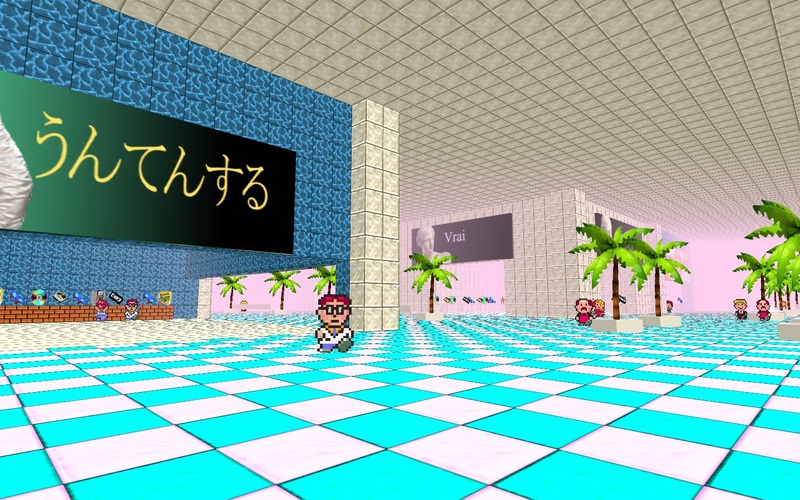 Building of our 2014 post on Ambient music, we're shifting only slightly on the spectrum to explore the chill-out oddity that is Vaporwave. I'll admit, aside from a cursory awareness of the term, I paid vaporwave no mind until a THUMP article I spotted called out the song "真実の恋 (Shinjitsu no Koi)" by a duo that goes by the defiantly un-Google-able name 2 8 1 4. Set to the din of pouring rain and the pattering chime of synth tones, the song builds into a thick swirl of ambient textures and '80s new age drums that are equal parts Vangelis and CFCF. At first impression, it didn't seem like a sound that needed it's own genre—it has all the hallmarks of ambient or chill out, not some wildly divergent form of electronic music (not that 'wildly divergent' has ever been a precursor to coining a new genre term in electronic music). But then I started digging. It turns out the track is lifted from 2 8 1 4's 新しい日の誕生 (Birth of a New Day) LP, re-released in the fall on the Not Not Fun label after sneaking out at the beginning of the year as a limited run of CD-Rs. The guys behind 2 8 1 4 are two veteran vaporwave producers who go by Hong Kong Express and t e l e p a t h テレパシー能力者. They co-run a label called Dream Catalogue, which has put out more than a 100 releases under the vaporwave banner in the two short years it's been around. 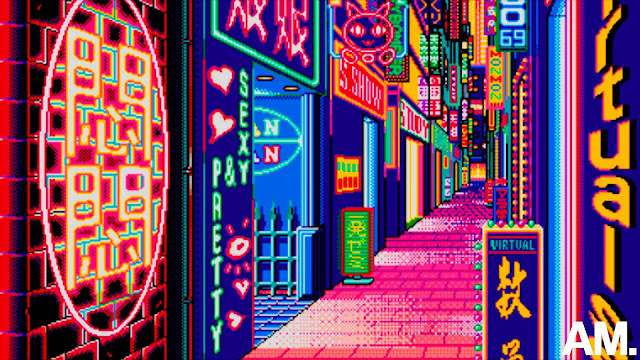 And this is just the tip of the iceberg of the '90s glorifying, globalization referencing, Muzak obsessed, Japanese character using, vintage web-design loving, cyberpunk scene that I've quickly learned very much makes vaporwave it's own thing. As someone who's only been listening to the music for a short time—it first emerged in the early 2010s—I'm not in a great position to try and pen a full history of the music, its aesthetic, its influences or the oddly tumultuous history it's evidently had. Let's just say that it is an entirely Internet-based creation that essentially stems from a mixtape made by Oneohtrix Point Never and a single release by an artist called James Ferraro. From there it's taken on a life of its own with heavily sampled songs that pull from smooth jazz, new age, R&B and '90s TV ads, twisted, chopped and screwed into hypnotic, looping and often dissonant chill-out cuts. Another vaporwave hallmark is that each release comes adorned with graphic artwork that's as idiosyncratic as the music's influences. Covers for albums from the Dream Catalogue discography alone draw on Italian sculpture, 8-bit sunset scenes, glitch art, Bladerunner-esque AND Moonrise City-esque cityscapes, retro visions of the future culled from grainy VHS tapes and Asian imagery that runs from Manga girls to the ever-prominent Japanese characters. Tracing its origins back to a single song or artist is as murky as the music itself. From the sounds of things, vaporwave really caught on with an album called Flower Shoppe by Portland artist called Macintosh Plus (who also goes by, among others, Vektroid and the very vaporwave PrismCorp Virtual Enterprises). From here you could say the sound went viral, with bedroom producers across the Net pulling it in different directions, latching onto and blowing out micro-elements of the genre—say its ironic love affair with mall culture and the smooth sounds that go with it—and, like the witch house and sea punk genres vaporwave is typically associated with, its 'virality' ran its course. This is where Hong Kong Express come back into play. While a disconnected array of producers from across the deep web continued to stretch the sound into thin and often unrecognizable versions of itself, the producer sought to re-solidify the genre's sound and what it could stand for. In interviews for outlets as diverse as Red Bull Music Academy and the synth-fueled blog NeonVice, Hong Kong Express has talked about the qualities he thinks make vaporwave great, namely the unique way artists working within the genre juxtapose nostalgia, romanticism and humor with uncertainty, bleak futurism and a strong affinity for the surreal and the dream-like. "I feel what links everything in the genre together is the sense of creating a dream-like or cinematic quality with their music, projecting a vivid image into the listener’s mind. For some, that may be simple nostalgia for a past era," Hong Kong Express says in his RBMA interview. "For others it is more heavily conceptual or evocative of a certain mood, and that is when it gets interesting for me." In his own music, he looks to create sounds he says are simultaneously sad or lonely and also full of hope and romanticism—themes he associates with being in a sprawling metropolis and with the works of Hong Kong filmmaker Wong Kar Wai. This is what lends the music the cinematic quality he says is, for him, the cornerstone of vaporwave—what gives it real emotion and staying power. It makes sense why so many artists working in the genre flock to the Dream Catalogue label. Between Hong Kong Express and t e l e p a t h テレパシー能力者, the two have taken hold of vaporwave and given it a truly mature air. The sound can no longer be typecast as pitched-down '80s smooth jams accompanied by a roman bust and a Miami Vice sunset. In their music as 2 8 1 4 and solo, they conjure textures not unlike Burial, the London artist revered for his bleak and beautiful productions. Burial's music brings to mind emerging from a London tube station to a gray haze and damp streets in the same way Hong Kong Express, t e l e p a t h テレパシー能力者 and 2 8 1 4 inspire visions of neon-bathed streets in Tokyo or, well, Hong Kong and the din of atmospherics that surround you as you stare up at the towering structures above you. Together, Hong Kong Express and t e l e p a t h テレパシー能力者 have forged a formidable artist stable for Dream Catalogue, an ever-growing collective of producers releasing material at lightning speed. The spectrum is impressive, attracting fledgling producers and veterans like Zomby alike, each adding a new dimension to a genre that, at its core, remains nebulous by design. 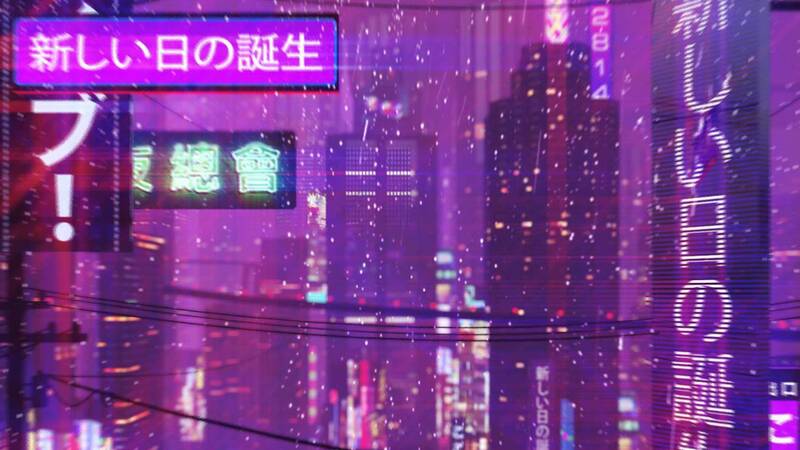 The song that drew us into the mist, 2 8 1 4's "Shinjitsu no Koi" is a pristine vaporwave entry point. As it floats along weightlessly through a hazy downpour, this soundtrack to a stroll through a non-existent dystopian city perfectly embodies the duo's dream-like world building. If vaporwave was a niche scene up until now, no more. UK bass enigma Zomby took to Benji B's BBC 1Xtra show this fall to lay down an exclusive vaporwave set and Dream Catalogue was the runaway focus. With 10 tracks of his set culled from the Dream Catalogue's, well, catalog, five of those from Hong Kong Express alone, Zomby's collabo here seems all but inevitable. The track itself injects a certain brooding darkness that balances the dreaminess of 2 8 1 4. Orlando producer and designer WIndows 98の—check out his (her?) phone cases—splits the difference between what could be referred to as first wave vaporwave and Dream Catalogue's more expansive ambiance. With it's lounge jazz sample and boom-bap hand claps, "Fall in Love" moves with more purpose than the other tracks here but maintains all the airy, tripped out ambient waves and strange samples that make vaporwave so compelling. Carrying on the un-Google-able theme, artist Remember remains impervious to biographical details beyond the producer's link to Dream Catalogue and this gorgeous ambient meditation. All rain drops, crashing waves and slow-burning androids-dreaming cyber atmospherics, the track came to our attention after its inclusion on 2 8 1 4's brilliant two-part mix compilation Room 2 8 1 4. One of the most prolific vaporwave artists out there, t e l e p a t h テレパシー能力者 churns out new music at a dizzying clip. Some falls to a side of vaporwave we glazed over here, pitched-down oddities that can come off more grating than anything else. But just as much of the producer's output hits all the right notes, whether it's ambient soundscapes or this track, "Last Hug." A stand out on his recent self-released Disconnection album, the song steps into slo-mo chugging house territory twisting up the ghost of some obscure Asian pop song.